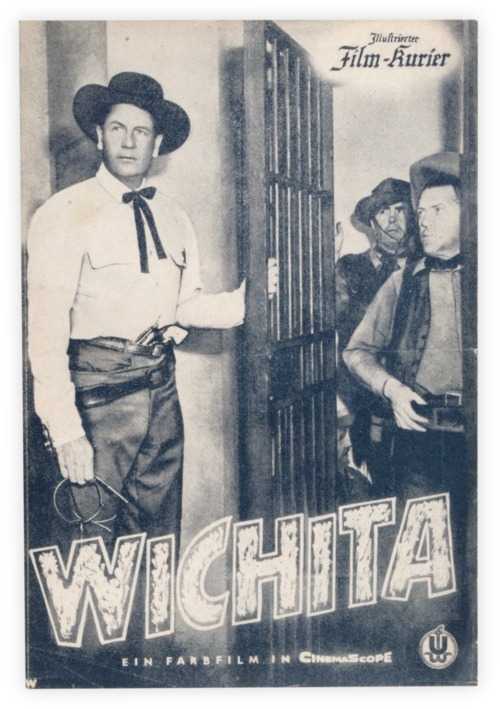 Bi-fold paper brochure for the 1955 movie, Wichita. Printed in German. Black-and-white photographs from movie throughout, including a bust-length photo of actress Vera Miles on the back. Joel McCrea stars as Wyatt Earp, who becomes a marshal and cleans up the lawless cowtown. Vera Miles, who grew up in Pratt and Wichita and was "Miss Kansas" of 1948, appears as Earp's love interest. Lloyd Bridges and Edgar Buchanan also star, and the film includes the music of Tex Ritter.